Two vintage and weathered galvanized buckets $2 each. A wooden handle garden hand rake and a "Good Grip" aluminum hand rake. $2 and $3 respectively. They just fit in perfectly in my "Raisin" crate with the other hand rakes and iron lady figurine. At a sale at an antique shop I purchased the Pelouze Family scale for $14, and the rusty Richard Strong kerosene lantern for $9. My Mom actually bought this for me at a consignment shop. Not sure I'm into vintage doll heads, but maybe I will find a use for it. Some of my shade pots were in just TOO much shade and had stopped blooming, so I moved them to a filtered sun area. I just purchased the "vintage garden" sign too. I also relocated the bean pot plantings to this filtered sun spot. The white metal thing in back is a futon back that was salvage and spray painted white last year. I'm happy with my new "old" finds! It is adorable. I need you to come and do my yard...but let's wait until it isn't 115 degrees!!! Very cute! I love that old kitchen scales. LOVE the buckets. I don't know why I like old buckets so much, but they are so fun to decorate with. Wow great finds for your garden. Love your garden finds and now you will work easier to make it look more beautiful than it is! Thank you for liking the shawl as a runner, I'm so liking it! Have a terrific week, my friend. Great finds for your flower gardens!! Looking forward to seeing what you do with the doll's head. 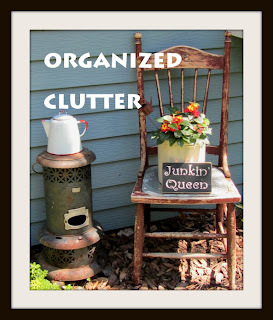 I like the junkin queen sign! Looks so cute on the cream can. I've got a great suggestion for the dolls head! Someone entered their project in the Best Succulents Container Contest 2013, and this was what they made their container out of; a dolls head, which was the mold for a hypertufa pot. They look great (click on my profile link to see them). 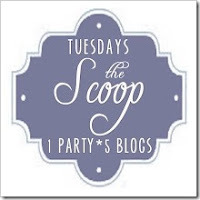 Your projects and collections are very eclectic and so much fun!